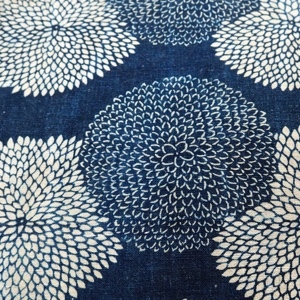 There is something beguiling about the muted edges of old Japanese stencil-dyed katazome fabrics. 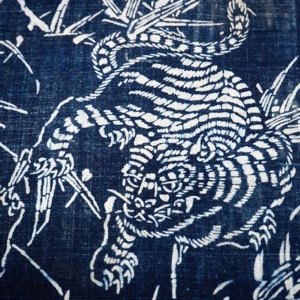 During the Edo period (1615 - 1867), every village had an indigo dyer who gave the inhabitants of rural Japan a "country palette of blue and white" textiles. Early examples of katazome cloth with their mellow and harmonious printed patterns on slubby hand-woven hemp and cotton, create a visual harmony that is difficult to match in any other culture. 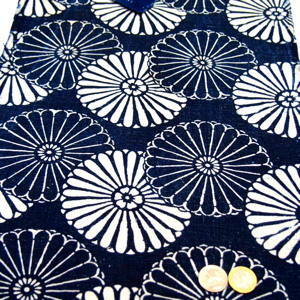 Stencil (katagami) dyeing or "katazome" has a long history in Japan. There are examples of stencil-printed papers dating from the 7th century (Nara period) in the Shosoin Treasure House in Tokyo. By the Edo period the technique was sophisticated and versatile enough to use on anything from farmer's work clothes to the elegant robes of samurai and wealthy townspeople. The process of fabricating katazome textiles is intricate and labour-intensive. Layers of hand-made mulberry paper are laminated together and immersed in the fermented juice of the persimmon fruit (kakishibu) which made the stencil water resistant. 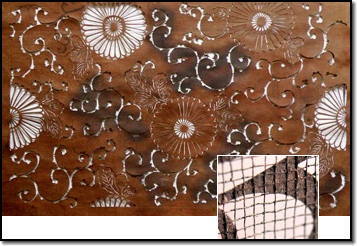 Then, intricate designs taken from nature were cut into the paper stencil with fine-edged cutting tools. These exquisitely cut stencils are works of art in themselves and many have been preserved in museums and private collections in Japan and abroad, including an extensive collection held by the Victoria and Albert Museum in London. Once the stencils are produced, raw material is stretched taut and the stencil is applied to an area of fabric. A paste made from rice flour and bran is applied to the fabric through the stencil, creating an area where dye cannot penetrate. The paste is allowed to dry thoroughly and then the background dye is painted onto the fabric, or in some cases the fabric is immersed in a dye-vat. Sometimes the dye is applied two or three times in order to reach the desired depth of color. 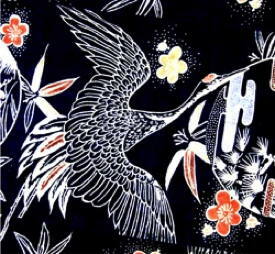 Japanese stencilled fabric. Once the dyer is happy with the color the fabric is immersed in water and the paste resist is washed away. Historically the fabrics were washed in a stream with the current of the stream acting as a gentle agitator to remove the paste. Not surprising that one of the Japanese's favorite motifs is of maple leaves floating in the eddies of a stream, a motif that you will see repeated in many Japanese textiles and kimono. During the 17th century, a time of relative peace and prosperity in Japan, the wealthiest of merchants had the financial capability to purchase expensive intricate silk garments. However, the Japanese nobility viewed merchants wearing silks as an unwarranted extravagance of their lower class status. The nobility was determined not to allow these nouveau riche merchants to be dressed in the same clothing as worn by members of the court. Silks were made for the nobility only! Controlling sumptuary laws enacted in 1680 and subsequently, restricted the ever expanding and wealthier merchant class to wearing only cotton and hemp garments. The unintended consequence of the sumptuary laws was that cotton (and to a limited extent hemp) textiles became more elaborate in design and complexity. Eventually cotton fabrics replaced the harsh hemp and those new textiles possessed colors, designs, and suppleness hitherto unknown to this segment of society. The fortunes of a wealthy merchant class permitted a wider variety of textiles to be made for the their use. Many in this growing trading class had the money to fund the creation of their own style of cotton garments, less costly, less elaborate than the silks of the nobility but beautiful nonetheless. It was the development and mass fabrication of the katazome stencil which permitted the rapid spread of such textiles throughout Japan. The Tokugawa Shogunate (1603 ~ 1868, military and de facto leader of Japan) encourage d and supported artisans in their production of katazome stencils. The stencils were initially crafted in specifically designated towns along the much traveled trade and pilgrimage routes surrounding Kyoto. Traveling traders purchased quantities of the stencils and then re-sold them to textile craftsmen throughout Japan, including remote rural regions. Japan's textile craftsmen were able to acquire elaborately stylized katazome stencils for dyeing striking fabric patterns, not seen before in the relatively isolated locations of the Empire. Those new cotton textiles possessed colors, designs, and suppleness hitherto unavailable to this segment of society. Additionally, more basic, less refined cotton textiles were made available, and were much desired, for the lower classes, especially for special occasions like marriages, religious ceremonies, and festivals. The katazome stencil craftsmen preferred creating katazome designs that symbolized special significance and beauty in Japanese daily life. Popular patterns included: a large variety of stylized chrysanthemums, arabesque filigree, cranes and turtles.